Taking tests can really scare some teens. Taking tests is a miserable process for a lot of teenagers. They feel nervous, overwhelmed, and stressed out. There is a lot of pressure to do well, but it is really hard for some people to relax enough to let their mind work. 1. Priming. I put this one first because it is one of the most important things to improve test scores that nobody does. A study came out that shows when adolescents spend 5 minutes writing down adjectives that describe what they think of when they imagine a Harvard professor right before they take a test, they score better by 10% or more on that test. Your teenager will spend a little bit of time writing down words like “brilliant, smart, intelligent, and bright.” After they spend 5 minutes doing this they’ve primed their brain to “think smart.” This means they are overriding the negative assumptions they have about their own test taking abilities. 2. Effective Studying. The vast majority of people spend time studying everything they need to learn for an exam. They actually tend to focus on what they already know or understand even though this is a subconscious action. They do this because it’s what feels comfortable. However, effective studying means spending virtually no time on what is already understood, and a lot of time on the challenging concepts. Your teenager does not need to review every section of the unit for their exam. Your teenager needs to spend time on their more shaky areas. It’s actually a waste of time to look over things they learned in class where they feel competent. 3. Study Timing. We’ve all heard this one before so bear with me if it’s a repeat. It is far easier to retain information if it is studied for up to one hour per day for a week before a test than if it’s studied for hours the day before. Cramming simply doesn’t work. For one a teenager who is cramming has more anxiety, which blocks his ability to effectively remember information. This takes self-discipline, but it also takes the yucky feelings out of taking tests. 4. Sleep. 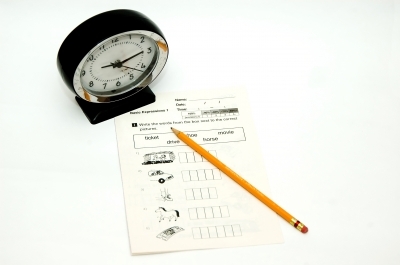 Your child needs 8-9 hours of sleep the night before a test. This is more important than studying until 2am. Our ability to retain, recall and utilize information is very, very directly linked to enough sleep. When we’re tired studying is almost a complete waste of time, and especially when compared with the benefits we are getting from sleep. 5. Association. If your teenager walks while they study, even slowly, their recall improves dramatically. Of course this isn’t possible for every subject, but walking while reviewing flashcards, or listening to a recording of the information they need to learn (anyone can do this by downloading a recording app onto their phone and then reading key passages from their textbook and notes), associations are made. Your teen will subconsciously pair a certain tree with a certain phrase because as they were walking past it they were learning about a specific thing. For example, your teenager might be listening to something about the Revolutionary War while they walk past your mailbox. When it comes time to take their test and they can’t quite recall that specific fact, if they picture the mailbox the fact will probably come to them. Isn’t it fascinating that the human mind works that way? Try these five steps with your teen. If you change nothing else, have your child get more sleep and spend the 5 minutes priming before the exam. This should help them with their test-taking abilities. It should also improve their confidence, therefore reducing their anxiety.